Few neurological conditions impact the quality and enjoyment of life of elderly Assisted Living Mesa patients quite as swiftly as dementia. A family of disorders most frequently impacting patients in its most diagnosed Alzheimer’s disease iteration, dementia deteriorates and impairs its sufferers’ cognitive functions until losses of memory, motor functions and self-awareness render them unable to care for themselves day to day. Perhaps even more tragically, the disease perpetually evades a cure because it strikes, methodically and relentlessly, at the single organ whose mysteries have most consistently eluded medical science’s unraveling: the human mind. As Assisted Living Mesa administrators and caregivers throughout North America prepare themselves for the baby-boomer generation’s unprecedented surge in citizens entering their retirement years, the urgency to understand and eventually cure and treat dementia has arguably crested. Fortunately, a recent limited-scale study may have further unearthed music therapy’s potential capacity to stem its onset. Centered on a sample of patients diagnosed with dementia from a single Senior Living Mesa community in Israel, the study observed how patients with reported individual backgrounds in singing responded to hearing and singing recordings of music popular in the region during the 1930s and ‘50s. 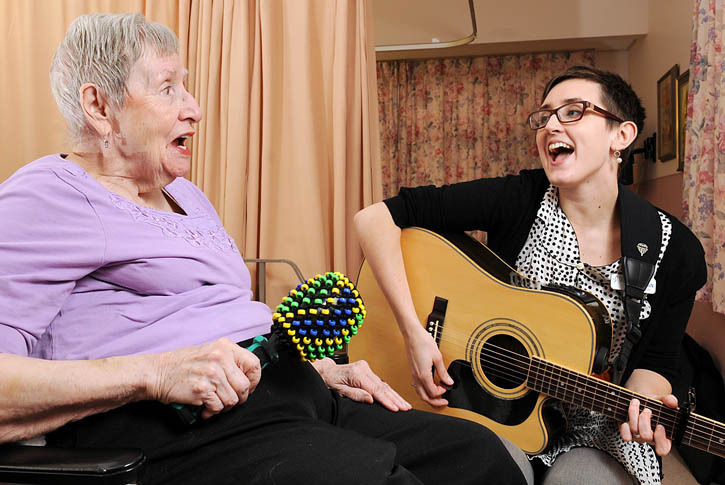 The six chosen subjects attended eight group music-therapy sessions over a one-month period. Over time, as the subjects shared their meanings and elicited memories associated closely with their social and national identities evoked by the beloved tunes, the group’s warm socialization melted the sense of isolation often associated with dementia and surpassed the affliction’s typical suppression of functional spontaneous speech. Instead, the communion forged by the shared bonds of music returned the patients’ senses of belonging and accomplishment. They opened themselves anew, both to one another and to researchers, as one memory unlocked the next, which unlocked another. Granted, the scope of the study has its limitations. Its findings are illuminating particularly in terms of music’s effect on patients with prior musical backgrounds and to the effectiveness of activating memories through already familiar tunes. Nevertheless, this could mark a meaningful step forward in music therapy’s application to gauging particularly Alzheimer’s patients’ levels of cognitive functionality.